THIS IS JUST ONE OF SEVERAL NATURAL STREAM RESTORATION PROJECTS CONDUCTED BY FOTSC, INC.
FOTSC, INC. CAN ALWAYS USE YOUR HELP AND DONATIONS TO CONDUCT PROJECTS OF THIS TYPE. WE ARE ALSO WORKING ON HISTORIC PRESERVATION AND ORAL HISTORY PROJECTS THAT CAN BENEFIT FROM YOUR SUPPORT AND DONATIONS. located just South of US 219. 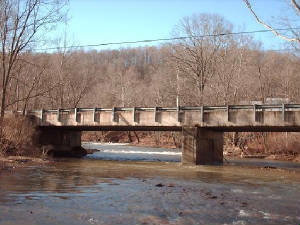 Both sites flow from a local swimming hole just above the bridge. 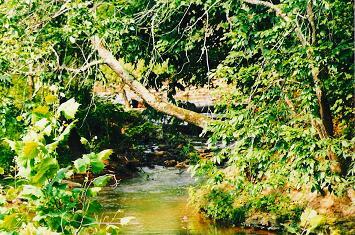 Each stream section was clear and free flowing before the structure was built. Now in Photo No. 2, the stream is filling with rock, fallen trees and other debris. The stream has split into two channels causing erosion along the banks. This is cutting into a farming field in the Right of Photo 3. Trees block the bridge opening during flooding and the water drives into the farming field, traveling through it and has closed US 219 with high water for the first time ever known. 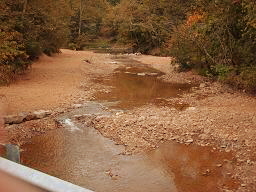 The natural stream project has been completed as of September 2006. 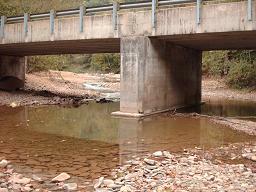 The cost of the project was approximately $50,000 and was funded by a partnership with the DEP and Friends of THE Second Creek, Inc. 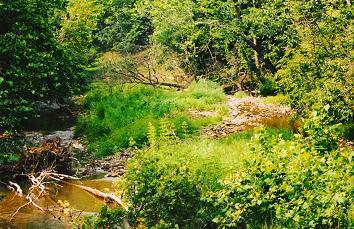 This is a natural stream restoration that will actually take several years for the final product to be produced. 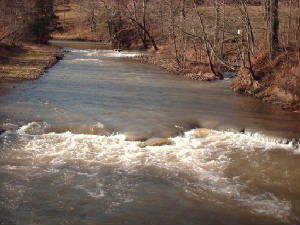 This type of operation only lays the ground work to allow the stream to restore itself over time. One day, in the very near future, this will once again be the Second Creek we know and love. Natural Restoration is working already!!!!!!! The two bridges are the same length. The stream is the same width. The height above the water is the same. The weight limit need of the road is the same at both locations. And last but not least, both locations badly needed a new bridge. The bridge designer thought that this bridge would benefit from a pier in the middle of the stream. This location had never had a pier before but it seemed a great idea at the time. All of this destruction was caused by a very small pier placed in the middle of the water course. And to compound the problem the designer failed to skew the pier to match the stream flow. (See the Photo below) A great idea with a horrible outcome. Friends of THE Second Creek Inc. are now working with the DEP using Natural Stream Restoration to eleminate this problem before it causes further destruction. Natural Restoration is already working!!!!!! If you would like to see these two bridges you only need to follow US 219 North from Union about 9 miles to CO. Rte 219/1. Or from Lewisburg, travel US 219 South about 12 miles to the same road. Bridge No. 1 is in sight of US 219. Bridge No. 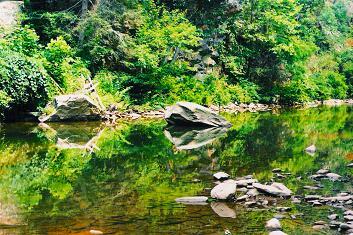 2 is located about 3 miles further on and just above Reeds Mill.